Rising high school juniors and seniors participated this week in the inaugural WE Lead conference sponsored by the Shackouls Honors College at Mississippi State University. 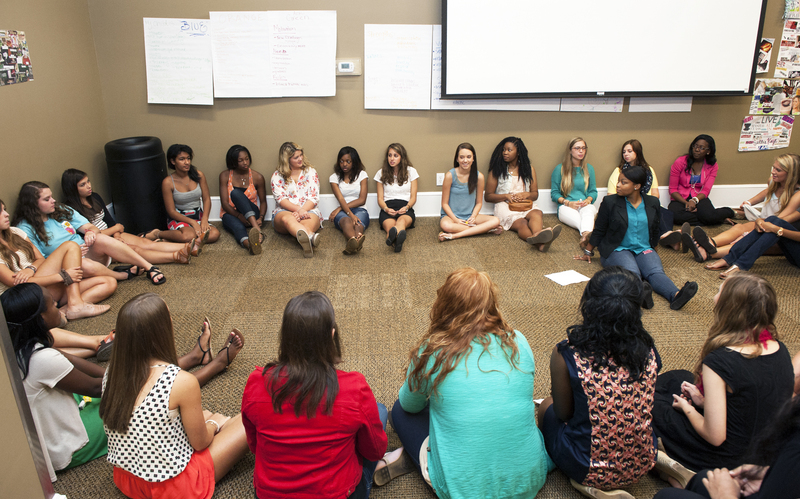 STARKVILLE, Miss.--The inaugural Women Empowered Leadership Conference gave 30 high school participants a new outlook on higher education, entrepreneurship, politics, health and a range of other issues this week [July 14-18] at Mississippi State. The university's Shackouls Honors College hosted the young women, all rising high school juniors and seniors representing the states of Alabama, Louisiana and Mississippi. Chris Snyder, honors college dean, said the conference was the brainchild of MSU junior Jamie Aron of Jackson. The presidential scholar who is double majoring in political science and mathematics also is the co-founder and president-elect of the American Association of University Women's e-affiliate branch at the Starkville campus. This year she will serve as the undergraduate representative on MSU's President's Commission on the Status of Women. Snyder said the honors college, Office of the Provost and Executive Vice President and other campus partners stepped in to assist in supporting and executing the event. Alumni donations helped offset costs, and participants were able to attend for a minimal administrative fee of $50. Aron said more than 240 nominations were made by high school principals, but participants went through a competitive application process before being accepted. The 2012 Jackson Prep graduate said students were selected from a wide array of high schools, with attaining diversity a key objective. Aron explained that she wants to encourage more women leaders in the world. "If I can work to change this on a community level, I hope it will spread to the state level and eventually impact women at a national level," Aron said. The week's purpose was to help participants recognize leadership characteristics and how they can become effective leaders who value listening and understanding. Facilitators also encouraged participants to consider career opportunities in STEM fields (science, technology, engineering and math) as well as humanities. "It's important to have strong women leaders in all career fields," Aron said. She said she hopes the young women will take skills developed this week home to their respective communities to make an impact in some form of leadership service. Activities included public speaking and small group research projects, as well as critical thinking to brainstorm solutions for key issues impacting women. Other MSU student leaders throughout the week included Kiara Benson of Memphis, Tennessee, a senior computer engineering major; Nandita Gupta of India, a senior majoring in electrical engineering with a minor in computer science; Roxie Raven of Okemos, Michigan, a sophomore political science major and presidential scholar; and Kate Thompson of Picayune, a senior biochemistry major with a minor in business administration, who also is a presidential scholar. Two graduate students served as conference counselors: Jessica Arends, a master's student studying cultural anthropology, and Ashley Baker, a sociology doctoral student and gender studies program assistant. A variety of guest speakers and activities through the week demonstrated different leadership styles and helped the young women identify their own strengths and personality profiles. Guests included MSU First Lady Rhonda Keenum and Starkville First Lady Lindsey Wiseman, as well as several MSU women faculty members and business leaders. Emily Catherine Graves of Hazlehurst said the week represented "one of the most powerful conferences I have ever attended. "The leaders were so inspiring. I know I'll see women's leadership in a completely different way than I did before," Graves added. Many of the participants agreed their favorite aspect was meeting other young women from different areas and backgrounds and becoming fast friends over the week. For more information about Mississippi State, visit www.msstate.edu.